The issue came to light when some people were listed as beneficiaries despite them not taking a loan. 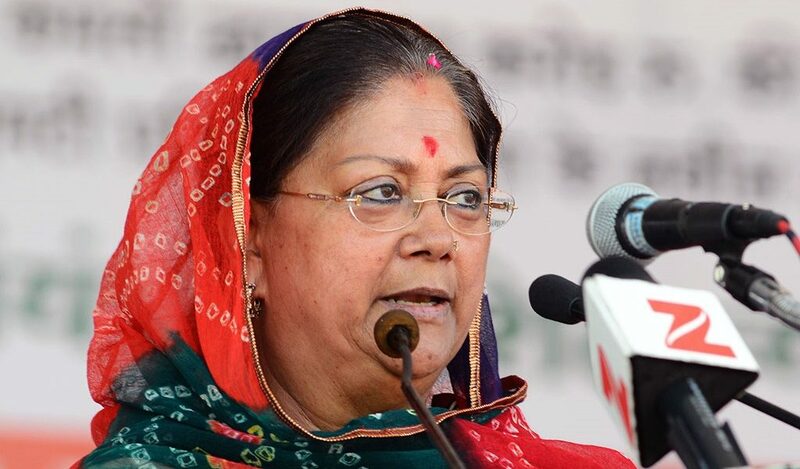 Jaipur: The former Vasundhara Raje government’s loan waiver scheme has come under the scanner as loans of hundreds of proxy beneficiaries were reportedly waived. The matter was highlighted as these proxy beneficiaries staged a protest outside the district administration in Dungarpur a few days ago – after they found their names in the loan waiver list uploaded to the state cooperative department’s website. They claimed they did not take any loan from the society as represented in the list. Raje announced during her tenure a one-time loan waiver up to Rs 50,000 for small and marginal farmers who had defaulted on short-term loans from cooperative banks. So far, the issue has been raised in three Large Agricultural Multipurpose Societies (LAMPS) situated in Govadi, Gamda Bamniya and Jethana villages in Rajasthan’s Dungarpur. However, the officials say things would become clear only after an investigation. “This could be a political issue also. Some villagers might say they didn’t take any loan even after doing so. The societies have all the records and we are investigating the issue. Only the uploaded data is under question, no money has been allotted for the waiver,” Vidyadhar Godara, managing director of the Apex Bank in Jaipur told The Wire. Even the district officials have iterated that the anomalies are only on paper. “The data was verified before it was uploaded to the website six months back. It’s surprising that people have come up only now over the anomalies. 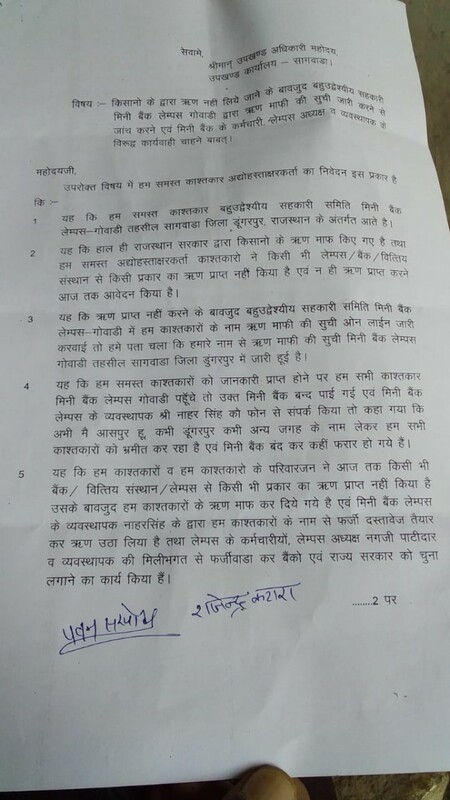 The waiver is only on paper, the society hasn’t received any money for the same. We received Rs 39 crore, but that has been allocated to disburse rabi and kharif loans, not for waiving [all] loans,” Heera Lal Yadav, managing director at Dungarpur Central Cooperative Bank told The Wire. We have two types of complaints regarding the loan waiver scheme of the previous BJP government. One, at Gamda Bamniya village, 825 beneficiaries were made eligible. Out of these, 263 beneficiaries were left out as their Aadhaar could not be verified. To balance the gap, the manager added 263 new names that haven’t sought any loan from the society. Second, some of the beneficiaries have complained that their loan amount has been falsely increased in the waiver list. We have ordered all the managing directors of the cooperative societies to verify the list for any such anomalies. 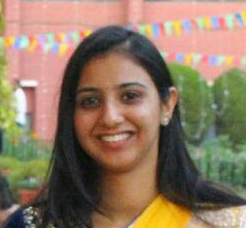 The additional registrar will arrive in Dungarpur for investigating the issue. Reports in the local daily have highlighted a similar issue in other districts [Bharatpur and Churu] also and we are promptly investigating them. 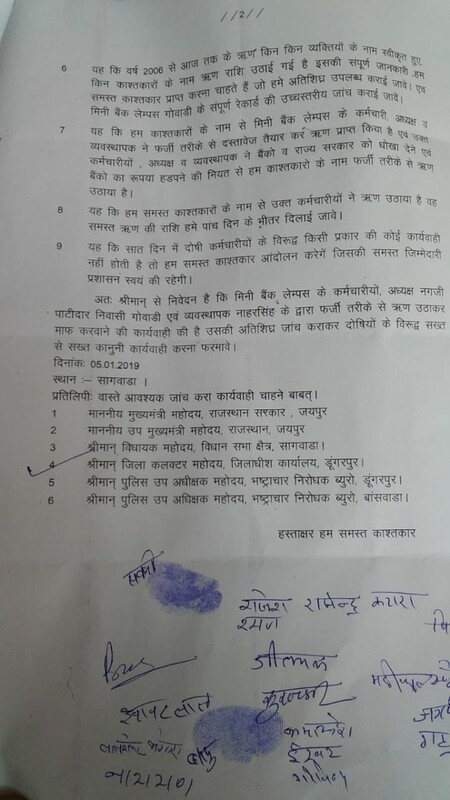 Residents from Dungarpur whose names were included in the list despite not seeking a loan from the society have sent a memorandum to the sub-divisional officer to probe the matter. They have also sought police action against the manager for misappropriating the funds in their names. After the list of loan waiver beneficiaries was uploaded online, we came to know that our names were falsely added in the list. We reached out to the manager several times regarding the same but he made excuses of being elsewhere each time and now he has also fled from the bank. Nobody among us or from our families have ever taken any loan from the cooperative societies or any financial institution. Despite this, the society falsely represented that we took loans through forged documents and later added it to the loan waiver list to gain money from the government. We demand that the loan amount that is falsely waived against our names be returned to us within five days and action be taken against all the employees who were involved in this fraud within next seven days, else we will stage agitation for which the government will be solely responsible. Pavan Sarpota, a Bharatiya Tribal Party (BTP) state secretary – who is also listed as a beneficiary despite not taking a loan – claims that a majority of the proxy beneficiaries in the list are tribal people. “Out of the list of 1,719 beneficiaries in Govadi, around 60% are falsely included and most of these beneficiaries are tribal people who wouldn’t have protested if our party did not win the election here,” said Sarpota. Activists believe that the condition of cooperative societies has been the same for years now. “If all the cooperative societies are investigated for such fraud, this would become the biggest scam,” Anjani Bansal, an activist who recently unearthed the State Bank of India’s irregularities in Hanumangarh told The Wire. “The reason why these societies brazenly commit fraud is because of the way they function. No customer is given any receipt for their transaction, which gives the manager the opportunity to do whatever s/he wishes to with the customer’s money,” he added.